Other Common Names: Common pasque flower, European pasque flower, windflower, meadow anemone, pulsatilla, pulsatilla (Spanish), Gewöhnliche Küchenschelle (German), pulsatille vulgaire (French), stor kubjelle (Norwegian), backsippa (Swedish), opret kobjælde (Danish), lännenkylmänkukka (Finnish). Habitat: Pasque flower can be found in Eastern and Central Europe north to Denmark and southern Sweden, and in western Asia. It prefers full sun or partial shade and thrives best in a well-drained, slightly alkaline soil. The plant can be propagated by seeds, root division or cuttings. Description: Pasque flower is an herbaceous perennial plant that belongs to the Buttercup family (Ranunculaceae). It can grow up to 40 cm tall with sturdy erect rhizomes, long stems, and hairy silvery-gray leaves. The flowers appear in spring. They are large, bell-shaped and have six dark violet flower petals. Varieties with pink and white flowers occur and are often grown in gardens for ornamental purposes. After flowering, feathery seed-heads appear that are very decorative. Pasque flower is hermaphrodite (male and female organs) and is pollinated by bees. Plant Parts Used: The above-ground parts of the plant are used as herbal medicine. The plant is harvested when it is in bloom. The herb is toxic when it is fresh, so the plant material must be properly dried before it can be used for medicinal purposes. The dried herb starts to lose its medicinal properties after a year or so. Active Ingredients and Substances: Pasque flower contains sesquiterpene lactones, protoanemonin, anemonin, triterpenoid saponins (hederagenin). In addition, it contains flavonoids (delphinine), tannins, carbohydrates (arabinose, fructose, galactose, glucose, rhamnose) and essential oil. In herbal medicine, it is not always distinguished between the plant species pasque flower (Pulsatilla vulgaris) and small pasque flower (Pulsatilla pratensis) as they are considered to have quite similar medicinal properties. In homeopathy, it is mostly small pasque flower that is used and in traditional herbal medicine, many other species have been used that belong to the genus Pulsatilla. In China, for example, bai tou weng (Pulsatilla chinensis), an important herb in Traditional Chinese Medicine (TCM), is considered a good treatment for infections in the digestive system, especially amoebic dysentery (amoebiasis). Spring pasque flower (Pulsatilla vernalis) also belongs to the same Genus, but very few medicinal uses are associated with this beautiful spring plant. Pasque flower was a very popular medicinal herb in the past, and it was used for centuries to treat a variety of ailments. The plant’s juice was used as an herbal remedy for warts, the powdered root was used as sneezing powder and it is known that the herb was used as a treatment for plague in many countries. As a treatment for high fever, it was believed that when the fresh finely shopped plant was placed on the wrists which resulted in blisters, forced the “evil” causing the fever to come out. The herb was traditionally used as a treatment for a cough, insomnia, and against a convulsive pain in the genital organs of both sexes. Therefore, it was often prescribed for premenstrual pain, especially in the context of “nervous exhaustion”. 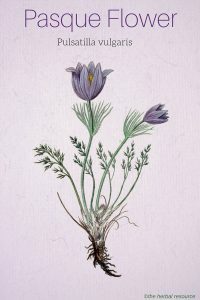 Pasque flower was also used as an herbal remedy for ailments associated with the digestive system and the urinary tract. In addition, it was used as a treatment for neuralgia, migraine, and inflammation of the skin and the mucous membranes. In the 1800s pasque flower was popular as a treatment for menstrual problems, conjunctivitis, and other eye ailments, severe coughing (whooping cough), intestinal worms, eczema and meningitis (acute inflammation of the protective membranes covering the brain and spinal cord). Pasque flower is not used as much in herbal medicine as it was before, but it is still considered a valuable remedy for cramps, menstrual disorders, and anxiety. It is often used specifically to treat a pain in the genital tract in both men and women (eg. in the uterus, testicles, and epididymides), in particular where there is a combination of vaginal cramps and general nervous tension. The herb may also be helpful as a remedy for irregular periods, premenstrual syndrome (PMS) and menstrual cramps. In addition, the herb is believed to alleviate stress reactions, anxiety and headaches associated with these ailments. In France, the herb has traditionally been used to treat a cough, and as a sedative for sleeping disorders. Extracts of pasque flower have been used to treat certain diseases in the inner eye, including inflammation of the iris (iritis), inflammation of the outer coating of the eye (scleritis), disorders of the retina, cataracts, and glaucoma. The herb has otherwise been used as a treatment for coughing associated with of asthma and pertussis, and other respiratory ailments like bronchitis. The antibacterial properties can make it useful in treating skin infections, especially boils. An oil or tincture of the herb can be used locally to lessen ear pain. As a tincture: 1:10 in 40% alcohol. 1-2 ml three times daily. As a liquid extract: 1:1 in 25% alcohol: 0.12-0.3 ml three times daily. Pasque flower (and other plant species belonging to the genus Pulsatilla) are quite toxic when fresh. The fresh unprocessed plant should therefore never be used as medicine. This is because the plant contains a substance called ranunculin, which is poisonous but when the herb is cut or crushed, an enzyme is released which converts ranunculin into protoanemonin, which is a very irritant yellow essential oil. Protoanemonin can cause severe skin irritation (including blemishes) and if swallowed, it can cause severe kidney and urinary tract damage, as well as paralysis of the central nervous system. However, when the harvested plant material is dried by heat, the protoanemonin is rapidly broken down and converted into another non-toxic substance known as anemone. Without chemical analyzes, however, it is difficult to know how quickly this conversion occurs. For this reason, the dried pasque flower herb should be used with great caution and only by qualified healthcare practitioners. Ingestion of large doses of the dried herb has been reported to cause severe gastroenteritis. Use of high doses of preparations made from dried herb has also been known to result in kidney and urinary tract irritation. These observations indicate that protoanemonin may still be present in dried plant material. 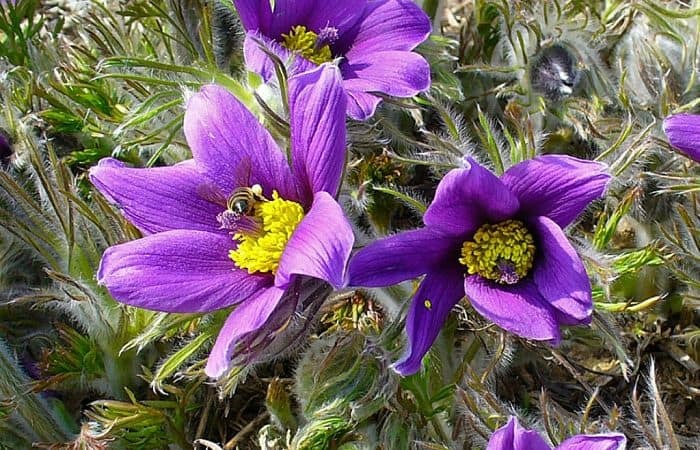 Pasque flower should under no circumstances be used during pregnancy or when breastfeeding. Skin contact with the fresh plant can cause skin irritation. When using herbal-based painkillers such as pasque flower, a caution should be exercised in the following circumstances: When using strong synthetic painkillers, pain in children, neurological diseases, depression and psychosis, liver and kidney disease, and for those who have experienced allergic or anaphylactic reactions. Prolonged treatment with herbal analgesics is not recommended. Foster, Steven and Rebecca L. Johnson: Desk Reference to Nature’s Medicine. Washington D.C., National Geographic 2006.